He got HIV as a teenager, but today Luna Luis Ortiz is the "father" of New York's famed House of Khan. He lost is virginity when he was 14. 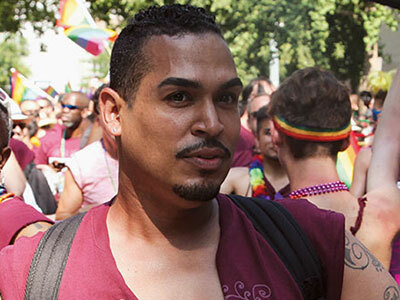 Soon after, Luna Luis Ortiz discovered he was HIV-positive. It was 1986. Some teenagers would implode but Ortiz turned that diagnosis into something positive: Two years later he began his work as an HIV awareness spokesman for youths living with HIV. Today, Ortiz is the father of the House of Khan, a part of New York City’s vast underground ball culture, an LGBT subculture where groups vogue and compete for prizes. The community is divided into houses, with mother and father figures at the top of the ranking. The House of Khan gave Ortiz a purpose and today he plans the annual Latex Ball, a giant celebration that is now in its 24th year. Ortiz has other skills too. He studied photography at the School of Visual Arts and worked alongside icons like David LaChapelle and Nan Goldin. In 1995, Ortiz became a member of the Archive Project at Visual AIDS, a group that preserves and celebrates the work of artists living with AIDS, and since 2007 he has been working for Gay Men’s Health Crisis, promoting HIV education and prevention to youths of color through health fairs and social marketing campaigns, using his own story to inspire, motivate, and educate LGBT youths of color. Read our full list of the 20 Amazing HIV-Positive Gay Men here.